… and reads it to you that evening. And it makes you tear up it’s so beautiful and intricate and moving. What lesson do you take from this extraordinary moment? 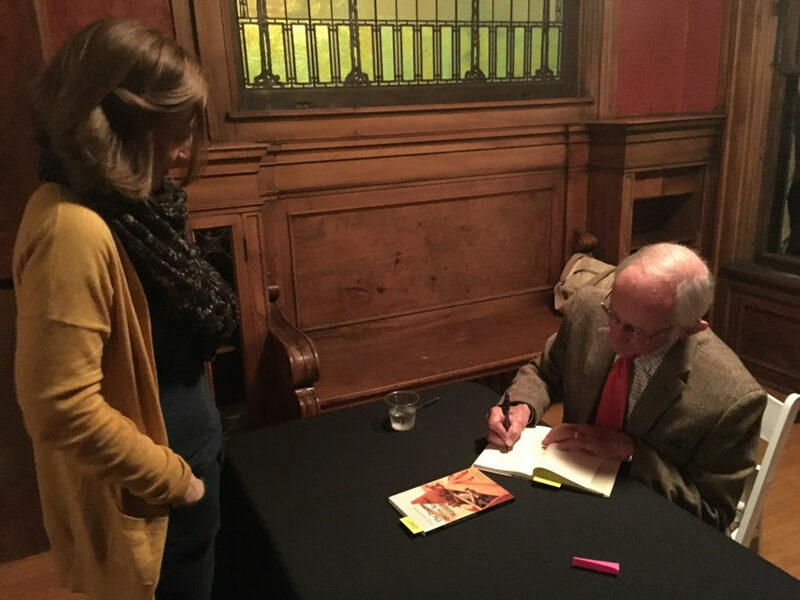 From knowing that a former Poet Laureate spent hours of his morning capturing the essence of a memory into lines of poetry and then spoke it into the air on a Friday night in Omaha, Nebraska, and you were one of the few in the room to hear it? Start by being hard on yourself: Why didn’t you write this morning? If you had a regular writing habit, you might be able to write about a conch shell in a way that makes people catch their breath when you finish. You need more discipline. Then tell yourself this is about longevity. Sure, your poems aren’t spinning out of your head and onto your computer screen like that, but maybe if you keep at it for the next 30 or so years you’ll get there. Don’t give up. Then listen carefully when Mr. Kooser responds to the audience question, “What is poetry to you?” Listen to the charming man in the bright orange tie, perhaps an homage to the perfection of October. Listen as he pauses before he answers, gathering up the thousands of words he’s spoken on this subject and sifting through them for the ones he wants tonight. Listen to his response. When he says it, first you’ll turn to your husband who is already offering you a pen so you can capture the line exactly. Then it will settle into your soul that this is the work you’ve been doing and the work that will continue to bring you life. This is work that does not feel like work. This is your great pleasure. This is open eyes and heart and mind. The discoveries are the gifts; the poems, if you make them, are the record. Oh, beautiful – what he said and that you got to hear it. Also beautiful that you recorded it for us. And that Dan was handing you the pen. And the encouragement to be a poet. I love everything about this. Thank you for sharing it with us.